Letterpress dates back to the mid-fifteenth century when Johann Guttenberg introduced movable lead type to the Western world (example above is movable wood type which is very similar). Each individual character was cast in lead and set by hand. 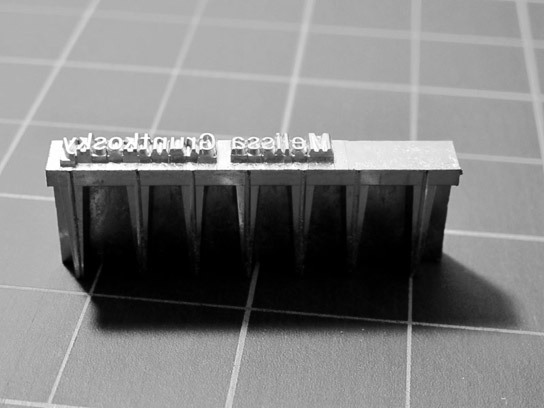 Over time some technologies improved productivity, such as a linotype machine, which cast entire lines of type in lead (below), and presses continued to evolve through the end of the industrial revolution. Letterpress printing, however, fell out of favor in the nineteenth century with the introduction of offset printing but was still commonly used in commercial printing through the mid-twentieth century. 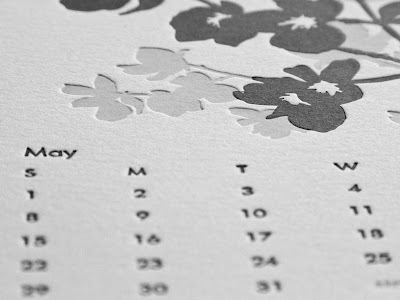 Today, letterpress printing is used mostly by artists or craftsman to produce invitations, stationery, high-end ephemera like greeting cards or posters, limited edition artist’s books, and small runs of independently published books. 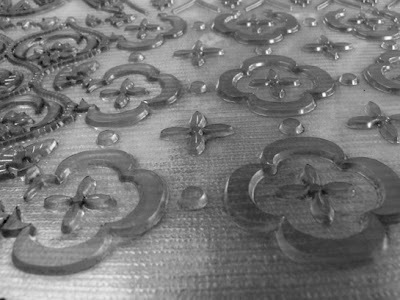 Though some printers still prefer to hand set their type and use antique “cuts” (zinc or magnesium engraved images mounted to wood), many prefer using polymer plates (below), a technology that transfers digitally rendered images or type onto a thin plastic plate that is adhered to a base to make it type-high. Letterpress tends to be more expensive compared to other methods of printing like off-set (how books or magazine are generally printed) or digital printing. The process is far more time consuming because many presses are hand-fed and operated, applying a single ink color per run. Not to mention the time it takes to lock up a layout in the press bed, align the paper to the layout, troubleshooting the press, or the added time of hand setting text. Items are also printed on high quality papers in order to achieve the lush impressions of the type or image that punch into the paper, a characteristic letterpress has become known for (below). 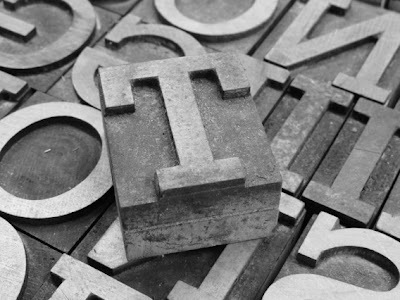 Since the 1990s there has been a resurgence of interest in letterpress printing. Though reasons for this are purely speculative some say it’s a reaction to computer technology and the desire to work with one’s hands. Fortunately there is an amazing community of letterpress printers and enthusiasts around the globe willing to share information, teach classes, or help you find a press of your own. If you are interested in learning more a good start would be to visit the website fiveroses.org and read their “Introduction to Letterpress Printing,” or visit the Briarpress website which is an excellent source for equipment, classes/workshops, jobs, and an active forum. The lost art of beautiful typesetting.